Founded in 1974, Atlanta Metropolitan State College (AMSC or Atlanta Metro) is a public access institution governed by the Board of Regents of the University System of Georgia (USG). The mission of AMSC is to provide high quality, low-cost access to post-secondary education, primarily to residents in the metro-Atlanta region. An essential component of the College’s mission is to provide a holistic experience for students that integrates academics and a range of co-curricular activities, including experiential learning, life-skills training, leadership coaching, and civic/community services. The core target of the College’s outreach is to provide post-secondary education access to a broad demographic of underrepresented, underserved students that will positively transform their economic, social, and civic standing in society. AMSC has a diverse, 2,800 student population, composed of a 3:2 ratio of traditional/non-traditional students; 40% adult learners; fully commuter campus, with race demographics of 92% African-American, 3% Caucasian, 3% Hispanic, and 2% Asian. Although 25% of AMSC’s students require at least one learning support class, for the past several years, the College has consistently managed to maintain the second highest three-year Associate’s Degree graduation rate among State Colleges in the USG. AMSC leads the State College sector in Associate’s degree graduation rates for African-American students. Seventy-four percent (74%) of Atlanta Metro’s students receive the Pell grant, and 90% of its students receive some form of financial aid. Approximately 32% of AMSC’s students major in Business and Computer Science related programs, 18% major in STEM and Allied Health programs, 30% major in Social Sciences, and 20% major in Humanities and Fine Arts. Since 1974, AMSC’s history is replete with thousands of success stories of students who enter AMSC, many in learning support classes, who graduate from AMSC, attend and distinguish themselves at the most prestigious professional and graduate schools in the country, and become recognized as authorities in their careers. The College takes great pride that 60% of its student population are first generation college students, and 95%+ are Georgia residents, from metro-Atlanta urban communities. Upon attaining their degrees, most of AMSC graduates return to metro-Atlanta cities, serve as productive citizens, with impactful careers, contributing to the economic growth and civic life of the State of Georgia. Atlanta Metropolitan State College was approved for a level change in 2012, and is currently a level two SACS accredited institution, authorized to offer baccalaureate degrees, with majors in Business Administration, Digital Media and Entertainment, Applied Mathematics, Biological Science, Criminal Justice, and Organizational Leadership, a fully online e-major program. Other AMSC signature programs include the Moses Ector Law Enforcement Leadership Academy (MELELA), a 1+2 Joint Program in Radiologic Technology with Grady Hospital, several transfer articulation agreements with Atlanta Technical College, and a teacher education program offered by Kennesaw State University on the AMSC campus. AMSC engages in numerous metro-Atlanta and community-based partnerships that “connect the college to the community.” AMSC partners are from a range of sectors, including (1) corporate, (2) secondary and post-secondary education, (3) small businesses, (4) medical, (5) entrepreneurships, and (6) Faith-Based/Private institutions. Atlanta Metropolitan State College has a $114M economic impact on the metro-Atlanta region. Atlanta Metropolitan State College has two overarching Complete College Georgia (CCG) priorities: (1) to achieve and sustain, at a minimum, the national graduation rate of 24% for associate’s degree seekers, and a 70% graduation rate for bachelor’s degree seekers, (2) to award 600 post-secondary credentials annually, by 2025. 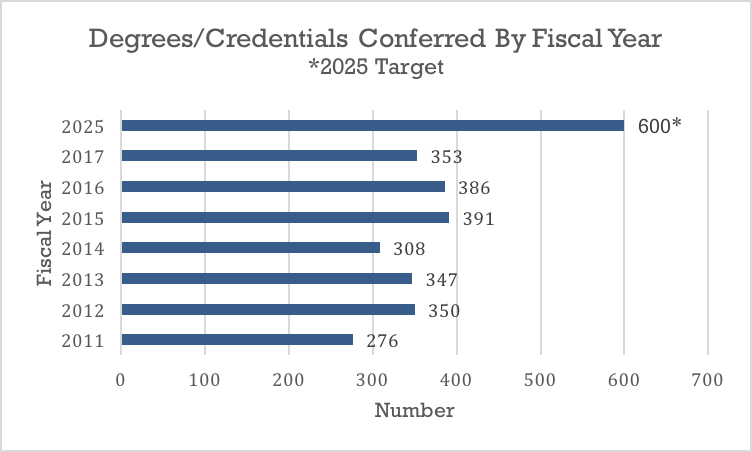 Since the initiation of CCG, AMSC has increased its conferred credentials from 276/year to 353/year, representing a +40% increase in credential conferred over a five-year period (Graph below). The broader scope and greater impact of strategies presented in this CCG update will move the institution closer to its 2025 target. AMSC fully embraces and advises its full-time students to utilize the “15-to-finish” strategy put forth by Complete America Georgia and promoted by the USG. With the “15-to-finish” strategy, AMSC advises students to register for 15 credit hours each semester, resulting in graduation with the Associate’s within two years of matriculation. A load of fifteen (15) credits is the optimum balance for many students, particularly for traditional students who live in campus housing, and have the wherewithal to spend most of their time in the campus environment, with essentially a single primary focus and few or no competing interest to attaining the degree. The situation is quite different for commuter, part-time students. Most have competing interest such as family and full-time employment, with additional financial responsibilities. For these students, 15-to-finish is obviously unfeasible and impractical to successfully sustain over a two year period. Nonetheless, milestones and goal-setting for completion is also important for these students. Thus, “1-in-3” provides a meaningful and achievable alternative, particularly for part-time students who are unable to successfully achieve the 15-to-finish goal. “1-in-3” challenges all students (part-time and those with other limiting factors) to finish the Associates degree within three years, and the Bachelor’s degree within six years. Atlanta Metro will employ a range of strategies, including academic advising, interventions, and monitoring activities, provided below, to achieve the “1-in 3” objective. 55%-60% or approximately 1600 AMSC students consistently register part-time status (less than 12 hours). Students who register part-time regularly graduate at a fraction of the rate when compared to those who register full-time on a regular basis. This strategy will reduce the time to completion of part-time students and is projected to have a significant impact on the completion of part-time students. Provide intrusive advising, that aggressively promotes, strongly encourages, and guides students to follow alternative, and newly designed program pathway maps that provide 3-year pathways to graduation, which include summer course schedules and expectation of attendance. To achieve the “1-in-3” goal, part-time students must register an average of 10 credits per semester, and full-time students 12-13 hours per semester. The overall goal for full-time students, however, is to move them to the 15-to-finish strategy. Utilize analytics, for integrating student maps, advising data, course selection/demands, and historical registration patterns to ensure students have the on-time, courses (campus and online) they need, while also maximizing the resources allocation of the College. Atlanta Metro tags this strategy as “Smart Scheduling”, which will be implemented in the 2017-18 academic year. Monitor and provide interventions to increase the earned/attempted credit hour ratio. Increases in earned/attempted hours will have a significant impact on student completion. The fall 2016 CCG result, an average load of 13.5 credit hours for AMSC’s full-time students, is within reach of the 15-to-finish target, though there was not significant change from the previous year. For the upcoming year, the College will introduce the new intervention strategies and activities listed above with the objective of increasing the load of full-time student to the 15-to-finish target. In addition, the College will focus more of its effort on part-time students, who are further from their 10 credits per semester registration target. The College has learned that no single intervention strategy is more effective than the other, but that the success of any strategy depends on the extent that the interventions can be operationalized to meet the individual needs of students. The decrease in the earned/attempted hours, from the previous year, will require additional focus because repeating courses, or not being able to use course credits toward the degree, delays student completion. Numerous factors limit part-time students from registering full-time, thus delaying their graduation. These factors include: (1) errors or lack of good choices in course selection, (2) changing program of study resulting in loss of credits, thus extending time to graduation, (3) academic jeopardy, which places students on warning, probation or suspension, delaying completion or causing drop-outs, (4) financial aid problems linked to Satisfactory Academic Progress (SAP) requirements, and (5) lack of early academic support, resulting in an increase in course attempts, earned/attempt credit hour ratio, and delay in completion. The AMSC Academic Alert Program was expanded and realigned with the Center for Academic Advising to ensure that academic jeopardy and high-risk students are served in a more effective manner to promote their completion. When disaggregating and normalizing for the number of degrees conferred by age, non-traditional students (students who begin College within five years of high school graduation) were conferred degrees at approximately twice (1.7:1) the rate to that of adult learners (25 years and older). Thus, a high CCG priority is to increase the completion of adult learners. This strategy potentially impacted 1060 (40%) adult learners during the fall 2016 semester. Expanding access to online courses increases the options for adult learners to take a wider range of courses, as well as increase their course load, particularly while managing competing interest (i.e. work and family responsibilities). Collectively, this strategy shortens time to the degree and increases course/completion rates for adult learners at AMSC. Provided a variety of adult learner focused or “friendly” online courses. Note that these courses have the same rigor and content as other courses, but vary in the pedagogical needs specific to adult learners. The adult learners online percentage headcount and pass rate dropped slightly when compared to those from the previous year. When disaggregating these results, the College discovered that certain online courses are prominent in driving the current results. AMSC offers several online “Adult Learners Friendly” courses, including: Math, English, First Year Experience, AMIR, History, Political Science, and Business Administration. As expected, Math, Business Administration, and English courses have lower course success rates than others, and these classes are driving the lower results from the previous year. The College will refocus more of its efforts on these high-risk areas in the upcoming year to reach the success rate targets for adult learners. Serving the Adult Learner population requires tailoring academic interventions that fit within the demands of life and their real-world challenges. AMSC continues to use Adult Learner Satisfaction survey data to improve the on-line learning platform so that it continues to foster healthy interactions among students with peers and instructors. Several new online resources were rolled out in the 2016-17 school year to assist adult learners. These included increased chat capabilities for students with their instructors for real time feedback. An e-Librarian was also a new feature embedded into the online Adult Friendly courses, with great success. The e-Librarian is equipped with videos and detailed guides that provide insight and support for conducting scholarly research. Adult learners also have the ability to chat, real-time, with the e-Librarian, which provides real-time support, specific to the individual needs of the student. Atlanta Metropolitan State College congratulates four faculty members: Drs. Todd, Akoh, Gray, and Ravi, who published a paper in the Online Journal of Distance Learning Administrators, titled “Engaging Adult Learners Online Through Technology, Andragogy, and Flexible Course Design: From Theory to Practice.” This publication also serves as Chapter 1 in the book titled, The Handbook of Research on Technology-Centric Strategies for Higher Education, available at amazon.com. The impact for this strategy is approximately 260 students per semester. In addition to shortening time to degree for high school students, this strategy also creates a pipeline of college-ready student to enroll in AMSC baccalaureate programs after high school graduation, thus addressing an essential priority to sustain and grow high producing educational programs. The AMSC dual enrollment strategies cover a range of activities, including: recruiting (enhanced), transportation, financial aid/admissions literacy workshops, academic support, book loans (to defray cost), campus orientations, and day-to-day monitoring of student progress to ensure the success of dual enrollment students. Increased emphasis, including early enrollment of high school students in the dual enrollment program, has been placed on high school students attaining the Associate’s Degree at high school graduation, and has led to success. In the past, this strategy focused on three Early College partnerships (Maynard Jackson, Booker T. Washington, and Carver Early College High Schools). In spring 2016, AMSC secured an additional Early College partnership with D.M. Therrell, which the College now provides four (4) APS Early College programs. The 172% increase in Dual enrollment students over a two-year period demonstrates the demand to continue this program. The dual enrollment student’s high pass rate of 87%, though slightly decreasing for fall 2016, clearly demonstrates the capacity of dual enrollment students to succeed in college level classes. Moreover, the ability of dual enrollment students to graduate from high school with the Associate’s degree is a win-win for all stakeholders of the dual enrollment program, and identifies an important source of students to contribute to the State of Georgia’s 2025 CCG target. A low student/staff ratio is important for the success of Dual Enrollment (DE) students to provide the range and quality of services and support structure they require. The AMSC Dual Enrollment Coordinator is currently responsible for monitoring the academic success and individual needs of the Dual Enrollment students. Additional academic and social support structures are essential and must be a top priority to support anticipated growth in proportion to the number of Dual Enrollment and Early College students. Appropriate Academic support for Dual Enrollment students is essential. In FY2017, to ensure higher success and retention rates, Dual enrollment students were provided additional support by a Student Support Specialist (SSS), which allowed enhanced monitoring of students in danger of failing grades prior to the midpoint of the semester. The SSS also worked closely with the Center for Academic Advisement to “Early Alert” students requiring individualized academic success plans. The additional program support allowed the Dual Enrollment Coordinator more time to grow relationships with AMSC current partners, as well as the opportunity to establish new relationships with neighboring school districts. The adjustments outlined above allowed more time for the Dual Enrollment Coordinator to plan academic and social events (i.e., Resume Building Workshops, Field Trips, Early College Week) for the students. These enrichment activities not only increased the interest of students in the Dual Enrollment Program, but they also established peer-to-peer networking and support structures between students in the program. In addition, the Dual Enrollment Coordinator expanded parental activities and engagement, including mapping strategies for their children to continue with AMSC to obtain the bachelor degree upon high school graduation. Twenty five percent (25%) of AMSC students, each semester, are enrolled in at least one learning support (LS) class, thus any improvement to reduce the number of LS students or reduce their time in learning support classes is an institutional priority that will result in a significantly positive impact on student retention and completion. Early integration of LS students into gateway courses builds their self-esteem, agency, self-determination, and translates into higher retention rates, better grades, and ultimately higher completion and graduation rates. Despite their historical barriers, many learning support students persevere and attain associates and bachelor’s degrees. There are numerous examples, annually, of former AMSC learning support students who transfer to and subsequently complete professional/research universities with distinction, and sustain successful careers. The number of “co-requisite or co-req” gateway courses were increased significantly to 12, moving approximately 40% of learning support students from lower level foundation learning support courses to gateway math and English courses, with a co-requisite learning support lab requirement. Placement of learning support students is determined by MPI and EPI scores, which are calculated for high school students by combining their admissions test, ACCUPLACER, scores and high school GPA. The integration of learning support students into gateway courses with other students is a departure from traditional placement requirements. This restructuring of learning support requirements and placement has multiple benefits, including: (1) reduces the learning support requirement of students by 3-6 credit hours, (2) shortens time to degree, and (3) reduces cost to students. The baseline results, indicated above, are cautiously convincing and optimistic that College Algebra (Math1111) students, with the new intervention strategy of a co-requisite learning support lab requirement, out-perform other learning support students who take College Algebra after completing the lower level foundation learning support course (MATH0098). This result, though preliminary and determined from a limited sample size, supports the national data that early assimilation of learning support students into gateway courses, while providing them “on time” and additional support, leads to better results and higher pass rates than the historical pre-requisite model. In the historical pre-requisite model, students must first finish all learning support requirements before taking gateway math courses, such as the Math 1111 Algebra course. Further monitoring of these data in the next CCG update is needed to draw stronger conclusions. Class performance is stronger when the same instructor teaches both the gateway and learning support co-requisite courses. Many unexpected factors come into play when integrating LS students into gateway courses, such as the social dynamics and interactions between LS and Non-LS students in the class; Being careful to not stigmatize students who require an additional one hour co-requisite class is important; The difficulty in the process of mainstreaming LS students into rigorous gateway courses should not be underestimated and should be comprehensively planned and implemented. The highest attrition of the college is among continuing/returning students, particularly through the first semester sophomore year. Therefore, any success in increasing the retention and completion of continuing/returning student has enormous potential to positively impact completion goals. To that end, the College employed three strategies to reduce attrition with this student cohort to increase their RPG and completion: (1) pre-register continuing/returning students, in the current semester, for the next semester classes, (2) provide GAP funding for those continuing/returning students who drop-out due to the lack of small dollar amounts (up to $500) of financial aid, and (3) monitor student course selection and academic progress carefully to ensure they stay on-track with program maps and completion planning. Data clearly show that students who pre-register are more likely to return the subsequent semester, particularly for spring to fall semesters, where a larger gap exist between classes, when compared to fall to spring semesters. Data show that 20% - 30% of commuter students do not return between the fall to spring semesters, and that the attrition rates for these students increase an additional 5% - 10% between spring to fall semesters. Pre-registration strategies, therefore, are used to increase the retention of continuing/returning students, and ultimately their college completion. Collectively, these strategies can potentially impact up to 1900 students, each semester. roviding GAP Funding – the College provides funding of small dollar amounts (up to $500) for students who demonstrate great promise, but whose financial needs prohibit them from registering and completing their degree. This support will be increased for the FY2018 school year. providing Emergency Funding – Beginning fall 2017, students who demonstrate emergency need may receive funding support for unexpected emergencies that prohibit them from registering for and attending classes. These emergency funds, granted once per year per student, while funds last, are designed to provide financial support to low-income students who otherwise do not have the financial wherewithal to attend and complete college. The success of RPG strategies is attributed to broad-based participation, including administration, faculty, and staff support and coordination, with careful planning and consistent implementation of strategies. The Complete College Georgia efforts of Atlanta Metropolitan State College are driven by the day-to-day implementation of RPG (retention, progression, and graduation) strategies. The College projects continuous RPG growth, particularly with continuing/returning and part-time students, targets for FY18.